The grunts and officers scurry across the battle field like frightened ants. You? 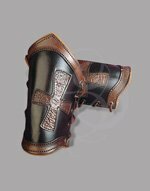 You stride calmly across the field, giving an ocassional, stoic order, picking your target and taking it out with a few well placed strikes, then continueing on your way. You are the Overlord. And the gods help anyone who gets in your way. 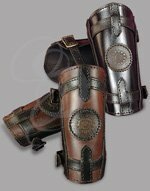 These bracers are similar to our warlord bracers, but more so. What's that supposed to mean? well, they are plated like the Warlord bracers, but they also have strands of chains in between the plates, for additional strength and style. 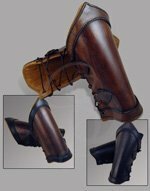 Thick straps secure these bracers to your arms and double stitched buckles make sure they stay secured. 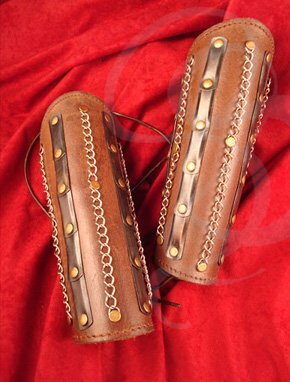 They are part of the Leatherworks collection, which is the highest end bracers we carry.